Schools in the cinema learn about climate change through the documentary Chasing Corals. 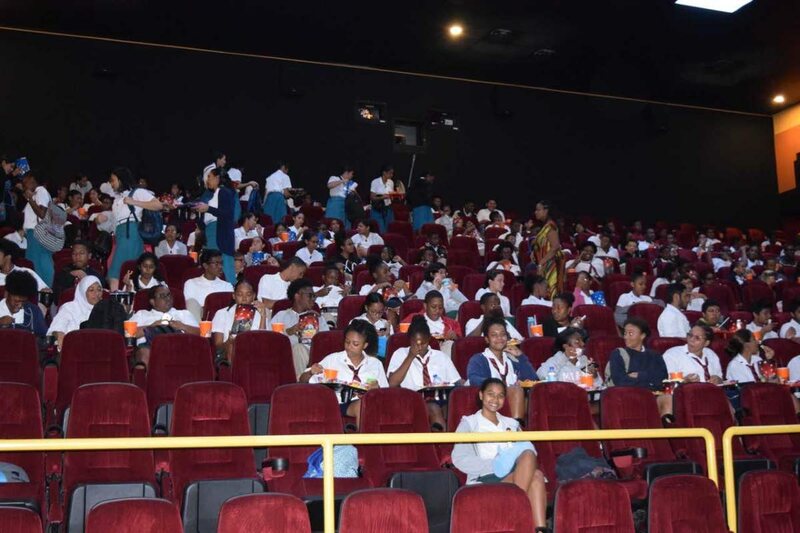 STUDENTS from across TT made their way to MovieTowne in Port of Spain and Tobago to view the documentary Chasing Coral and to find out about coral reefs as the climate changes. Chasing Coral is an Emmy-award winning film that follows scientists, coral enthusiasts and film-makers to record the devastating impacts of the third global coral bleaching event as a result of man-made climate change. This year has been designated the International Year of the Reef (IYOR) to bring attention to this global bleaching event. The International Year of the Reef – TT initiative (IYORTT) was formed as a partnership of marine scientists, conservationists, state agencies and NGOs acting voluntarily to raise awareness about coral reefs as indicators of climate change. After each screening, marine scientists and conservationists – partners in the International Year of the Reef TT initiative – led the discussions. Last week Tuesday, Wild Tobago and the EMA answered questions from St François Girls’ College and the British Academy. On Wednesday, there were screenings in both islands. In Trinidad, the University of Trinidad and Tobago (UTT) Marine Science Department showcased a collection of marine animal specimens that live on coral reefs and answered questions from Bishop Anstey High School, Port of Spain; St Anthony’s College, Westmoorings; St Joseph’s Convent, St Joseph and St George’s College, Barataria. In Tobago, The Buccoo Reef Trust and Seven Environmental led discussions about plastic pollution with Mason Hall Secondary School, Signal Hill Secondary School and Roxborough Secondary School. On the Friday, the last day, attendance peaked with schools from South East, Port of Spain, The Environmental Club from The Libertville TML Primary School, Rio Claro; San Juan North Secondary and St François College. The UWI’s Zoological Society also mounted a display of marine coral skeletons and specimens. In Tobago, Wild Tobago joined the Tobago team to talk about the importance of protecting Tobago’s reefs. Students came from Pentecostal Light and Life, Michael K Hall, and Speyside High School. Also in attendance were representatives from the THA –the Division of Sport and Youth Affairs, the Division of Food Production, Forestry and Fisheries, as well as the campus dean, Dr Joan Bob-Ward and her colleagues from COSTAATT. This session included the use of virtual reality goggles to view coral reefs of the world. Reply to "Learning about climate change in cinema"